Longtime fans remember the Brawler for the years he has dedicated to making other superstars look good. From World Wrestling Federation Champions to low midcarders, the Brawler has never had a problem, to paraphrase Shawn Michaels, "laying down for anybody." In fact, one of the Brawlers career highlights came against the Heartbreak Kid. After winning a battle royal (thats right, winning) at Madison Square Garden in late 1997, the Brawler earned the right to face the Federation Champion -- Michaels at the time -- in front of thousands at MSG. Of course, the Brawler was promptly defeated, but he can tell his grandchildren that he once faced Shawn Michaels in the main event at the Worlds Most Famous Arena. Several years ago, the Brawler also appeared at a WrestleMania! He accompanied his then-manager Bobby Heenan to the ring at WrestleMania V so that "The Brain" could be stomped -- like the Brawler himself -- by the Red Rooster. The Brawler retired from active "competition" a few years ago, but he makes an appearance from time to time whenever another superstar needs to break a sweat -- or whenever a situation calls for laugh-out-loud comedy. 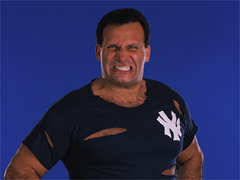 For example, at 1998s Fully Loaded, Mr. McMahon provided one of the most humorous moments of the year when he called on the Brooklyn Brawler to "replace" the Undertaker and team up with Stone Cold Steve Austin for the main event. Unfortunately for the Brawlers millions and millions of fans, the Undertaker eventually showed up at the arena, and the Brawlers services were not necessary. Although his won-loss record may not be the most impressive, the Brawler is one of the most entertaining competitors in Federation history -- perfect for the world of sports-entertainment.